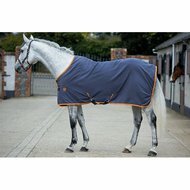 Our best selling stable sheet. 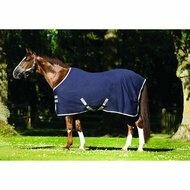 Ring spun and brushed polyester outerThis is a versatile cooler, stable sheet or travel rug, with moisture management technology to give it a high wicking factor, a classic cut and double front closures. 89% would buy this product again. 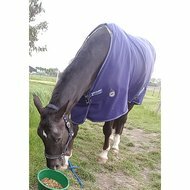 Beautiful thin blanket, fabric stays good for a long time. However, the chest closure with Velcro is open which comes on the skin. It is a nice thin blanket. A thin but solid substance. Fit is equal to the other Amigo blankets. Question: how many grams is this blanket? Answer: This is a 0 gram blanket. Question: More convenient when the amount of grams is included. How many grams is this blanket? 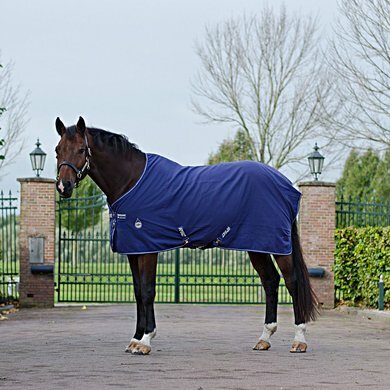 Answer: This blanket is 0 grams, a bit similar to a summer blanket. Answer: The material is woven roughened polyester. The blanket can be used as a stable rug, cooler or transport blanket. The blanket is not lined, 0 grams.